I thought I was over it. I thought for sure I could get past it, because I HAVE gotten past it! Even recently! So why am I paralyzed again today??? OK so here’s how the week has been: Monday morning I showed up for jury duty selection, and was ever so fortunate to not have to serve at this point (it just isn’t a good time right now for civic duties). Considering I had NO IDEA how the day (or week or longer) might actually turn out, I didn’t make plans to get any work done. 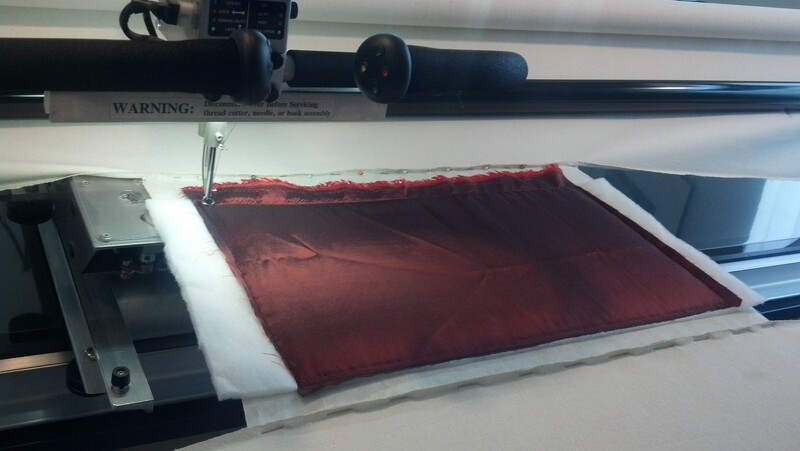 But I knew the next bit of work that NEEDED to be done was adjusting the timing on my longarm machine. One of my mentors suggested doing it on a weekday morning, so if I had any troubles I could contact APQS service and they’d be there to help. So when I got home, I was fortunate enough to have the time left in the day to attempt it. I’ve done it before, successfully, so I knew if I just followed the instructional video I would do just fine again. After a bit of frustration (from doing something wrong), and taking a break I finally got my timing successfully adjusted and machine completely cleaned. To test the timing, I thought why not put up a small piece of plain cloth and make a mini out of it? I couldn’t find a cotton fabric I wanted, sooo, up went a piece of silk. Blank slate. OK, break the ice – outline the perimeter. Done. 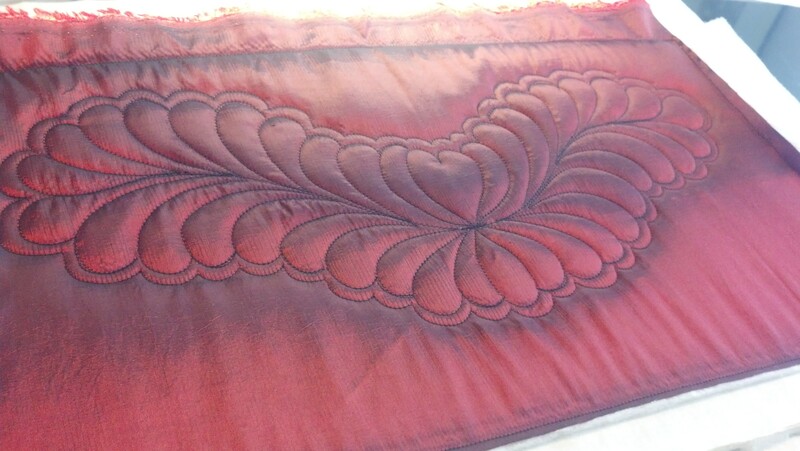 I saw I had an oblong space, so I decided to do a feather, with a heart at the top, since it was in burgundy silk, maybe that could go in my bedroom. I knew I wanted to echo it, and then decided to do the curl/paisley/echo thing I’ve come to really like around that, as a filler. Boom. Done in 10 minutes. For part 2 of the story, let’s back up a few days. I’m cleaning and organizing the house, basically, because I’m going to clean the carpets, so I need to move A LOT of stuff out of the way. In doing so, I found this cute little kit I bought in Colorado Springs, which, coincidentally was great for my jury duty experience (and doctors office visit today) because it’s small, handwork, easy to start and stop and tuck into my purse. First off, I never buy kits. This is literally THE FIRST kit I have EVER bought in my entire life. Secondly, I don’t hand embroider. 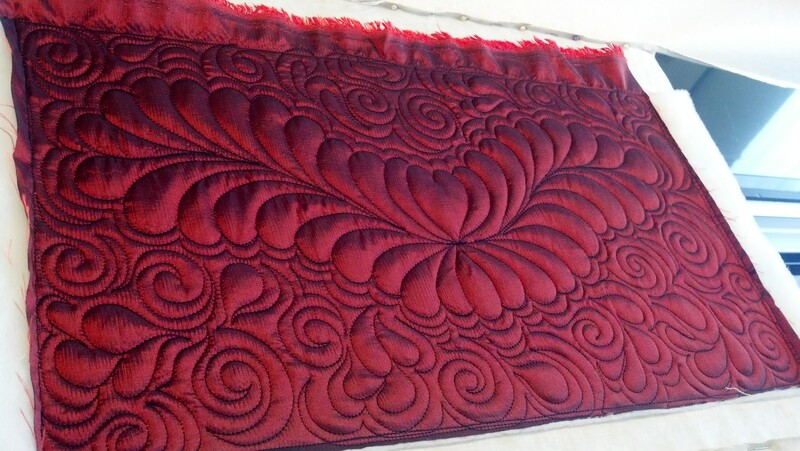 I am a quilter, and I make quilts. I’ve done a few stitches on some minis for friends, but not anything sufficient enough to call real hand embroidery. And third, I don’t follow directions. That’s not entirely intentional, I am just not good at following orders/directions/recipes, so I tend to sort of do my own thing. So off to jury duty I go, and bring this little bird thing with me. The selection process did take a little time, so I made some progress, which I continued later in the day. Unbelievably I finished it last night, and added a few beads that look like feed at his feet (not shown in the pic). Ultimately, he is part of a mini quilt, with blocks around this one, but I thought, what a fantastic way to stay busy while waiting ANYWHERE!!!!! So I started another one, but with black background and pink thread (to the right below). I’m going to bend his knee so he looks like a flamingo because I think they are the funniest birds on the planet. 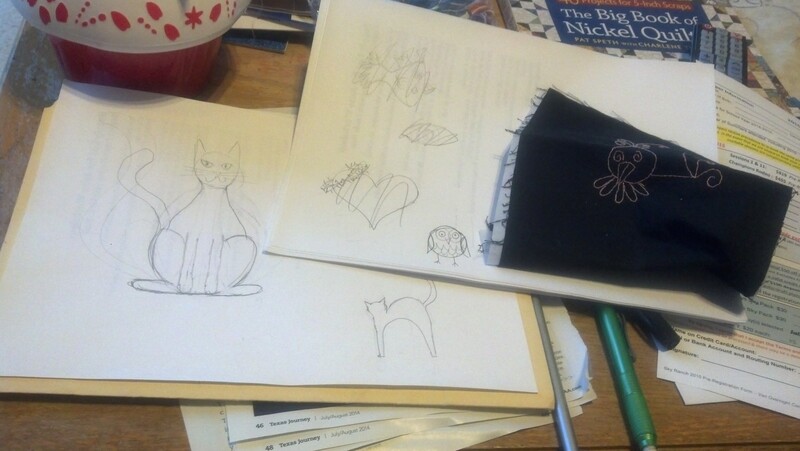 So as I start this new one, I tell my daughter, I think I’ll trace some more of these so I can make a bunch of them. She says, “Why mom? Make your OWN drawing!” Well, duh. There are more scratched out doodlings, I just didn’t put them in the photo. I feel like I am a vast vessel of ideas, but that I can’t bring any of them to fruition. I HAVE ideas, and they WILL work with a line drawing situation like this, I just don’t know what to do!!! I think, oh flowers, BEEN DONE. Ohhh, a tree, LAME. A bird – HELLO YOU JUST DID ONE! What I really wish is that I could detail in a pencil line what it looks like to echo emotion and feelings and hope. But I can’t figure out how to illustrate that. I tried a heart with a crown of thorns and frankly it looked ridiculous. 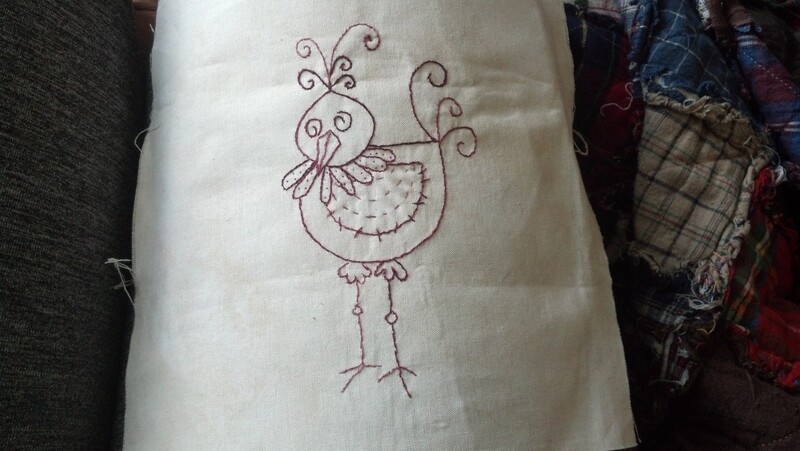 Second best would be to draw out something simple, like a cat or an owl or a bird, and figure out how to take it to another level by changing everything surrounding it (like adding beads, changing up the thread color, leg or tail position, blocks surrounding the embroidery). Sound familiar? Sound somewhat like my monthly block project? I think it does. But that still doesn’t help remove the feeling from me that all I can do is take something and tweak it. I want to make something unique, and I feel like instead I am taking something of someone else and just changing it, and that doesn’t feel as visionary to me (so maybe I should be confronting myself about not being a visionary here). I guess that’s something everyone wants – to leave their unique mark. Something that sets them apart, something THEY are known and recognized for. Maybe I’m putting too much pressure on myself , after all, this is my FIRST hand embroidery project. Or maybe I should just stick to quilting.